The family of Abraham Shakespeare reported him missing November 9. (CNN) -- Ten months after a multimillion-dollar Florida lottery winner was last seen -- and two months after his family reported him missing -- police Wednesday said they feared for the worst. 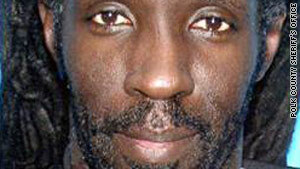 Truck driver Abraham Shakespeare, 43, won a $31 million Florida lottery prize in 2006. A year later, he won a court challenge from a fellow trucker who accused Shakespeare of snatching the winning ticket out of his wallet while the two were delivering meat to Miami restaurants. "Circumstances are mounting, according to our homicide detectives, that leads us to believe there is a very good chance he met with an untimely death," Sheriff Grady Judd said. When Thanksgiving passed without word from the missing man, authorities raised the reward for information to $5,000. "We don't have a body, we don't have Abraham Shakespeare alive," Judd said. "We don't know if he is dead or alive, but we are very suspicious and fear he is the victim of a murder." Judd said investigators were looking closely at Dee Dee Moore, an associate of Shakespeare, calling her "a person of interest" in his disappearance. No charges have been filed. Detectives say Moore paid people thousands of dollars to report false sightings of the missing man, according to Judd. On one occasion, he said, Moore paid Shakespeare's cousin $5,000 to send the lotto winner's mother a birthday card purportedly signed by her son. CNN was unable to reach Moore. Judd said that although she had been cooperative in the beginning of the investigation, she had since "lawyered up" and stopped talking to investigators. Before she stopped talking to them, Moore told Polk County detectives Shakespeare left the central Florida town of Lakeland because he was tired of people asking for money, according to Judd. But investigators found that all of Shakespeare's bank accounts and properties -- including a $1 million house Moore said she bought from him for $600,000 before his disappearance -- had been transferred into her name, Judd said. Additionally, he said, Moore had Shakespeare's cell phone and sent text messages to herself and other people purporting to be from Shakespeare and made fake phone calls to his mother to give the illusion he was alive. Moore told investigators that she had offered to help manage the newly minted multi-millionaire's finances after his win. Judd said that investigators believe most of Shakespeare's after-tax lottery payout of $16.9 million is gone. On the chance that Shakespeare is still alive, Judd urged him to contact authorities. "We're not positive he is dead or alive, we just want to know," he said. "If he would just let us know and we will end the investigation and he can go on with his life."